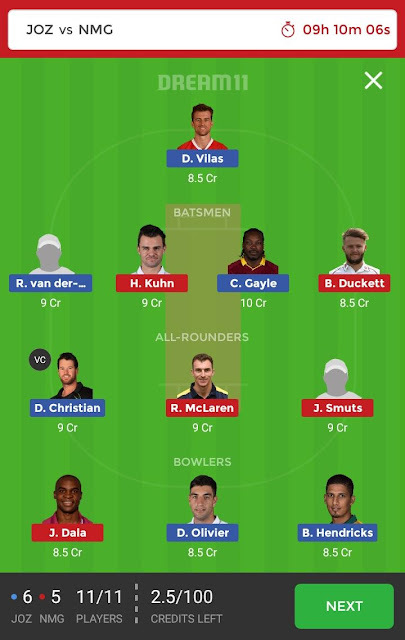 After a fantastic opening to the Mzansi Super League 2018, its time now for the all-important clash between the Jozi Stars led by the experienced campaigner Dane Vilas and Nelson Mandela Bay Giants which is led by JJ Smuts. Few South African players are involved in the only T20I against Australia, therefore, they won’t feature in this game for their respective sides. Reeza Hendricks, Dwaine Pretorius, Chris Morris, Imran Tahir and Kagiso Rabada will be missing this fixture. 🌟 Select your own captain with the help of Video. 🌟 If you like our app then please rate us 5 star to keep working further.